Loss of thrust (LOT) emergencies can be caused by various reasons -- for example, fuel exhaustion in the case of Tuninter Flight-1153, and birds strike in the case of US Airways Flight 1549. In LOT scenarios, pilots have a very short time to decide on a plan of action for landing their aircraft safely, and there is little room for error. Several factors, such as the altitude of emergency, aircraft surface damage, the prevailing wind conditions, and distance to nearby runways, need to be considered in the decision-making phase. 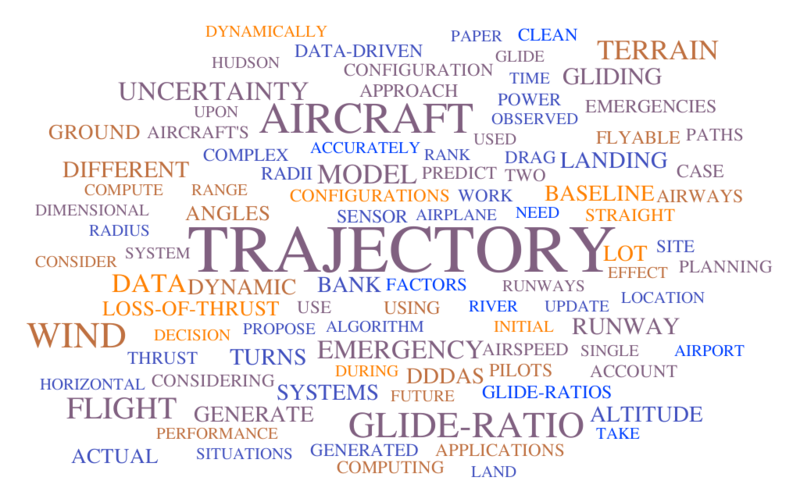 Therefore, there is a need for systems that can help pilots expeditiously make correct decisions by reducing the associated computational burden. The main goal of our project is to develop dynamic data-driven decision support systems to aid pilots in partial or total LOT situations. Introduction of automation in the decision-making phase can reduce the response time of pilots in an emergency situation, giving them a better chance to safely land their aircraft. This project was conceived at the Worldwide Computing Laboratory (WCL), Rensselaer Polytechnic Institute, as a child project of the PILOTS programming language.